The desire for land has been part of the American psyche since the time of the early European explorers, conquistadors, and settlers. Throughout the 19th century, the quest for land pulled Americans ever farther towards the West. It also drove government policies and military actions that removed Native Americans from their lands. While there was opportunity for American pioneers in the West, there was also a great deal of uncertainty. The decision whether or not to leave the relatively settled lands of the East was not an easy one to make. The lyrics to The Wisconsin Emigrant are representative of the discussions that went on in thousands of households as husband and wife debated whether or not to take their chances in the West. Thomas Jefferson promoted the idea that the United States should be a nation of small, independent farmers. This would require a great deal of land to accommodate the growing population. Jefferson drafted the Land Ordinance of 1784, incorporating territories west of the Appalachian Mountains. In 1803, as President, he purchased approximately 828,000,000 square miles of territory from France, doubling the size of the United States. Following the War of 1812, immigrants flooded into the United States to farm, work in factories, and build roads and canals. Because the soil in New England was poor and not ideal for farming, the region thrived on industries such as manufacturing, shipping, and foreign trade. Eastern seaboard land in the United States became scarce and expensive as industrialization advanced. For struggling New England farmers and factory workers, the lure of western lands for farming and independent living was strong. Many pioneers loaded their wagons and headed west. 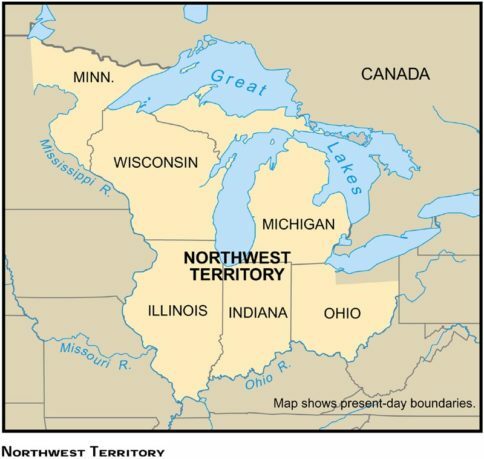 The Northwest Territory, which existed legally from 1787-1803, consisted of all the land in the United States west of Pennsylvania and northwest of the Ohio River. This included the present-day states of Ohio, Michigan, Indiana, Illinois, Wisconsin, and the northeastern part of Minnesota. The British Empire and France struggled for control of this region during the 18th century. During the Seven Years’ War (1754-1763) the Native Americans living in the area generally fought alongside the French, with whom they had longstanding trade relations. Britain was victorious and took control of the land at the end of the war. The Great Lakes region became part of the United States in 1783 with the signing of the Treaty of Paris that ended the American Revolution, but that did not end the disputes. For decades the British maintained a presence in the area and supported the Native Americans in their resistance against American expansion. Miami Chief Little Turtle led a confederation of tribes, including the Shawnee, Potawatomi, Odawa, and Chippewa, against the United States Army in the Northwest Indian War (1785-1795). The confederacy lost and were forced to cede extensive territory, including much of present-day Ohio. 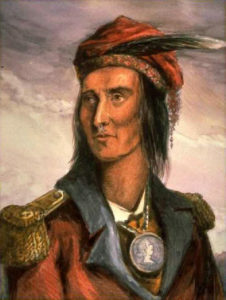 In 1810 Shawnee leader Tecumseh led an Indian confederacy against the U.S. Army. Tecumseh’s War bled into the War of 1812, with Britain and the confederacy ultimately being defeated. The end of the War of 1812 marked the end of British support for Indian resistance. The war also “renewed and reinstated the national feelings and character which the Revolution has given,” according to Albert Gallatin, the U.S. Secretary of the Treasury. “They are more Americans; and they feel and act more as a nation.” Americans turned to the federal government to cancel Native American titles to land in the Northwest and Indiana Territories. Official commissioners negotiated with remaining tribes for their lands and moved them farther west. In 1827 the Winnebago tribe, reacting to a wave of lead miners trespassing on their lands in what is now the state of Wisconsin, attacked some American civilians. The so-called Winnebago Uprising consisted of only one or two incidents, but it alarmed American officials. After a show of U.S. military force, the Winnebagos ceded the lead mining region to the United States. The Indian Removal Act, signed by President Andrew Jackson in 1830, authorized the president to grant unsettled lands west of the Mississippi River in exchange for Indian lands within existing state borders. Some tribes went peacefully. Others did not. Between 1830 and 1832 Sauk Chief Black Hawk led groups of Sauks, Meskawakis, and Kickapoos east across the Mississippi into the Illinois lands that were once theirs. Black Hawk believed that the treaties ceding Sauk lands had been signed without full tribal authorization. The U.S. Army drove the tribes back across the Mississippi River. Following the Black Hawk War, as this brief conflict is called, President Jackson ordered the relocation of all other tribes still living in the Northwest Territory to the Indian Territory across the Mississippi. 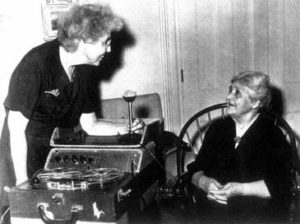 In 1931, 1941, and 1942 ballad collector Helen Hartness Flanders made recordings of “The Wisconsin Emigrant” from three different singers in New England. Between 1930 and 1958 Flanders, a native of Vermont, collected traditional songs and ballads throughout New England. Her collection of nearly 4,500 field recordings, transcriptions, and analyses are housed at the Flanders Ballad Collection at Middlebury College in Vermont. Some governor may be before that I die? My version of “The Wisconsin Emigrant” is based on the printed lyrics, chords, and melody in The Ballad of America: The History of the United States in Song and Story by John Anthony Scott. I had not heard any recording of the song at the time I learned it from the book. “The Wisconsin Emigrant” is the second track on my first album of traditional folk songs Over a Wide and Fruitful Land (Ballad of America Volume 1), released in 2004. The album tells the story of the westward expansion of the United States through the 19th century. “The Lovely Ohio” is an American folk song that arose from unknown sources in the United States during the late 18th or early 19th century. It celebrates the opportunities available in the Ohio River Valley, inviting settlement into the long-disputed lands. During the 16th, 17th, and 18th centuries, European nations that were establishing colonies in the Americas frequently clashed with each other and Native American populations. In 1756, years of territorial struggle between the British and French in the Ohio River Valley resulted in the outbreak of the Seven Years’ War, known in the colonies as the French and Indian War. Both sides established allies with local Native American tribes. With the defeat of the French in 1763, the British gained control of Canada and all land east of the Mississippi River. The French had generally respected Native American traditions in the Great Lakes region, and they established good trade relationships. When the British took control of the area following the Seven Years’ War, they restricted the tribes’ ability to trade and provoked distrust and hostility. Pontiac, a leader of the Odawa people, organized a violent uprising against the British confederacy that included nearly every tribe from Lake Superior to the lower Mississippi. Pontiac’s War, or Pontiac’s Rebellion, reached a negotiated end in 1766. In an effort to minimize further confrontations in the region, the British government issued the Proclamation of 1763 which forbade English settlement west of the crest of the Appalachian Mountains. It established the land as Indian territory. Colonists disregarded the proclamation and continued to settle in the territory, resulting in further violent clashes with local tribes. In an effort to quell the violence and quiet colonial discontent with the proclamation, the British government established subsequent treaties that acquired additional Indian land for British settlement. It would not be enough. The Declaration of Independence cited “raising the conditions of new appropriation of lands” as part of the justification for freeing the thirteen colonies from British rule. At the end of the American Revolution, Great Britain legally recognized the independent existence of the United States of America. Britain ceded claims not only on their colonies, but also on the lands between the Appalachian Mountains and the Mississippi River. The United States Congress passed the Northwest Ordinance of 1787 officially establishing the Northwest Territory, which included the Ohio River Valley. The new law set conditions for settling in the territory and addressed the rights of the Native Americans living there. The utmost good faith shall always be observed towards the Indians; their lands and property shall never be taken from them without their consent; and in their property, rights, and liberty, they shall never be invaded or disturbed, unless in just and lawful wars authorized by Congress. This was not to be. The violence continued as a growing population of Anglo-American settlers came to inhabit Indian lands. A series of United States government treaties and policies, backed by the U.S. Army, forced the tribes onto reservations west of the Mississippi River by the middle of the 19th century. Songs about the lives of common people that opened with the call “come all ye” were very popular in the British Isles in the 18th century. In the early United States, the “come all ye” format was the foundation for many new songs about the American experience. A song called “The Banks of the Ohio” appeared in the Forget Me Not Songster: Containing a Choice Collection of Old Ballad Songs, As Sung By Our Grandmothers, published in 1842. More than a dozen slightly different versions of songsters were published in the mid-19th century with this name. The subtitle Containing a Choice Collection of Old Ballad Songs, As Sung By Our Grandmothers suggests that the books included songs that were known perhaps fifty years earlier. and we’ll hunt the Buffalo. When we settle on the banks of the lovely Ohio. Following are the lyrics as printed in Alan Lomax’s 1960 book Folk Songs of North America. Lomax’s source for the lyrics and melody is singer Ed McCurdy’s recording from his 1956 album A Ballad Singer’s Choice. The liner notes for the album do not indicate McCurdy’s source for the song, but the lyrics and melody are very similar to “We’ll Hunt the Buffalo!” above, with one of the verses and the repeating chorus eliminated. My version of “The Lovely Ohio” is based on the printed lyrics and melody in Folk Songs of North America. I had not heard McCurdy’s or any other recording of the song at the time I learned it from the book. “The Lovely Ohio” is the opening track on my first album of traditional folk songs Over a Wide and Fruitful Land (Ballad of America Volume 1), released in 2004. The album tells the story of the westward expansion of the United States through the 19th century.